It's a Fact... Jeep JK Wranglers need underside protection - introducing the boat-sided UnderCloak Integrated Armor System. The CAD designed, CNC formed, laser cut 3/16" steel sets the benchmark for strength and the clear zinc plating forms a molecular bond to the steel protecting your UnderCloak from the elements. Introducing MetalCloak's JK UnderCloak Armor System. 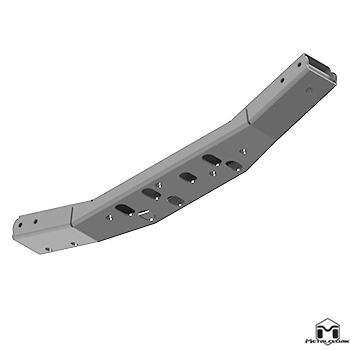 This belly skid is an integrated system that includes a heavy duty replacement Cross-Member, Oil Pan & Motor, Transmission & Transfer Case, and Gas Tank Skid Plates for the best protection. Made of laser cut 3/16" steel and is clear zinc plated to protect against the elements. CLEAR ZINC FINISH & BOAT-SIDED? YEP! Every edge of the UnderCloak Armor System is designed for maximum approach and departure angles leaving the possibility of hanging up on obstacles on the trail a thing of the past. By treating the UnderCloak Armor System with a clear Zinc finish, you are protected from the elements when you do scratch it up; the surface is paintable if you want to go custom. But why not recessed bolt holes? When products are new they fit just fine... now go bash them on the trail and see how they line up, they don't! In critical areas for attachment that can get misaligned we have encapsulated the head of the bolts with skid guard washers for the bolt head that protects and affords slotted holes to ease re-installation when servicing your Jeep. Our upgraded 3/16" steel replacement cross member is the benchmark of strength. CAD designed using Jeep's own Digital Files, the cross member and Under-Armor system will fit all models. Thicker steel and additional holes for attachment points on the driver side, there is no better way to support and secure the protective plating for your Jeep; finished in clear zinc for the best corrosion protection.